PT Biro Klasifikasi Indonesia (Persero) - PT BKI (Persero) or Klaisifikasi Indonesia is the national classification agency of Indonesia, fully-owned by the Government of Indonesia. PT BKI (Persero) is a reputable state-owned company in Indonesia that is involved in marine classification services. 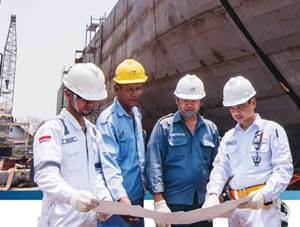 PT BKI (Persero) concentrates its business activities in the field of vessel classification and registration. PT BKI (Persero) running business in making a classification of Indonesian and foreign flagged commercial vessels regularly operating in Indonesian waters. Its business include vessel/ship classification, drawing approval, classification survey activities, industrial services, statutory survey, statutory authorization, and consultancy and supervision. According to information found in the Company's website as cited by JobsCDC.com, PT Biro Klasifikasi Indonesia (Persero) was established in 1964 based on the Government Regulation Number 28 of 1964 on the Establishment of the State Company Indonesian Bureau of Classification. PT BKI (Persero) is based in Jakarta and now has 4 main branch offices, 6 middle branch offices, 8 branch offices, and 5 business unit offices spread in all over Indonesia. Minimum D3 degree in Secretary from a reputable university with accreditation "A" and "B". Have experience with a minimum of 2 years as Executive Director or Executive Secretary. Able to operate a Microsoft office computer program and have good typing skill (fast and right). Have active English skills (oral and written). JobsCDC.com now available on android device. Download now on Google Play here. Please be aware of recruitment fraud. The entire stage of this selection process is free of charge. PT Biro Klasifikasi Indonesia (Persero) - D3 PKWT Staff BKI February 2019 will never ask for fees or upfront payments for any purposes during the recruitment process such as transportation and accommodation.